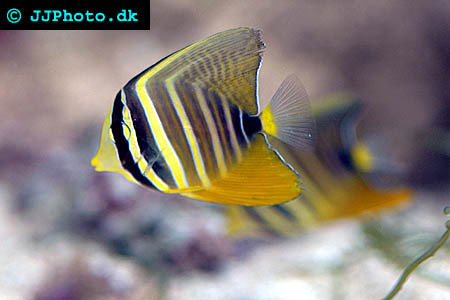 Company: Zebrasoma veliferum (Sailfin tang) is preferably kept with small fishes. Aquarium Setup: Zebrasoma veliferum (Sailfin tang) must be given a lot of space, strong water movement and plenty of hiding spots. They like Acropolis coral skeletons. Keep pH between 8.0 and 8.4 and water temperatures in the mid 70’s or the low 80’s Fahrenheit. Aeration should be vigorous. Food: Zebrasoma veliferum (Sailfin tang) feed on on micro- and macro-algae, preferably leafy macro algae. Feed your Sailfin tang a diet consisting of meaty and vegetable materials. Feed very small amounts, but several times a day. Periods of non-feeding are natural, since Sailfin tangs can store fat in body cavities. 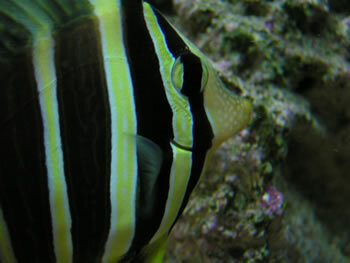 Breeding: We have no information about the breeding of Zebrasoma veliferum (Sailfin tang) in aquariums. Adult Zebrasoma veliferum - Sailfin tang picture.